Citation Information: J Clin Invest. 2007;117(3):590-592. https://doi.org/10.1172/JCI31505. Protein accumulation is a hallmark of many neurodegenerative disorders. In Alzheimer’s disease (AD), a hyperphosphorylated form of the protein tau (p-tau) forms intracellular inclusions known as neurofibrillary tangles. Deposits of p-tau have also been found in the brains of patients with Down’s syndrome, supranuclear palsy, and prion disease. Mutations in tau have been causally associated with at least one inherited neurologic disorder, frontotemporal dementia with parkinsonism linked to chromosome 17 (FTDP-17), implying that tau abnormalities by themselves can be a primary cause of degenerative diseases of the CNS. Removal of these p-tau species may occur by both chaperone-mediated refolding and degradation. In this issue of the JCI, Dickey and colleagues show that a cochaperone protein, carboxyl terminus of Hsp70-interacting protein (CHIP), in a complex with Hsp90 plays an important role in the removal of p-tau (see the related article beginning on page 648). Pharmacologic manipulation of Hsp90 may be used to alleviate p-tau accumulation in disease. Cellular fates of abnormal tau. The tau protein can be phosphorylated on a large number of serine and threonine residues along its length, resulting in an enormously complex pattern of potential phospho-isoforms. Under normal cellular conditions, each tau molecule contains only 2–3 phosphate groups and binds microtubules (18). Tau hyperphosphorylation to form p-tau is believed to be the trigger event in the tau aggregation cascade. The kinases responsible for this event are not known but may include CDK5, GSK3β, and MARK2. Soluble p-tau is believed to be the toxic moiety, while p-tau aggregation may represent a protective mechanism of sequestration. p-tau is misfolded, which results in recruitment of hsps such as Hsp70, Hsp40, and Hsp90. These chaperones attempt to refold the abnormal p-tau, which could ultimately result in p-tau reincorporation into microtubules. This reincorporation is most likely contingent upon dephosphorylation. P23 is found in mature Hsp90-substrate complexes and stimulates Hsp90 ATPase and substrate dissociation, promoting substrate refolding. If refolding fails, the p-tau–chaperone complex is reprogrammed to eliminate the defective p-tau protein. If substrate (p-tau) release is blocked by an inhibitor of Hsp90 ATPase, such as EC102, CHIP proceeds to ubiquitinate (U) p-tau and target it for degradation by the proteasome. 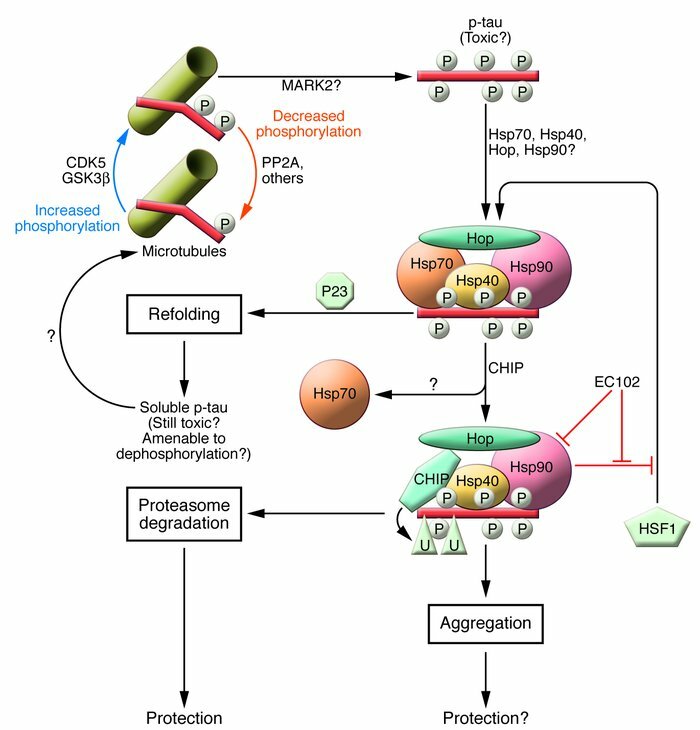 EC102 also induces an HSF1 feedback loop that leads to increased chaperone expression. In this issue, Dickey et al. (14) now show that Hsp90 inhibition with EC102 leads to enhanced CHIP-mediated degradation of p-tau both in human culture cells and in mice.